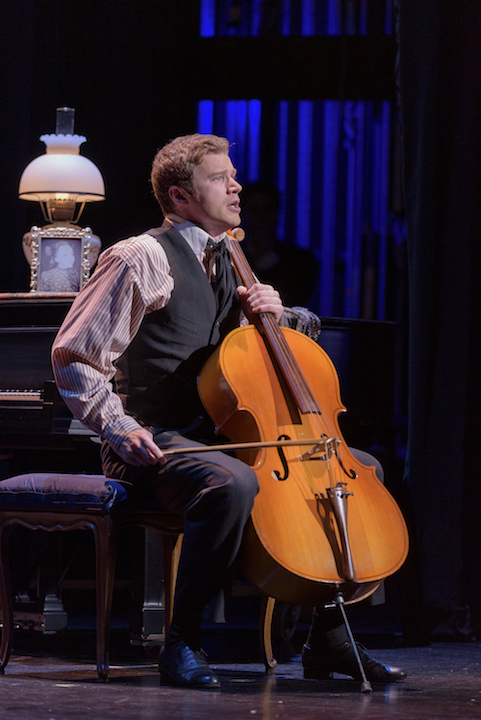 Now that Spring Break is over and subscription tickets are available for the Wisconsin Union Theater’s special centennial celebration next season – which includes superstar soprano Renée Fleming and pianist Emanuel Ax — here is an email interview that pianist Wu Han and cellist David Finckel (below, in a photo by Lisa-Marie Mazzucco), the wife-and-husband consultants and planners of that season, granted to The Ear. Could you briefly introduce yourselves to readers and tell them both your past and current activities? We have been performing on the world’s many concert stages for almost our entire lives. 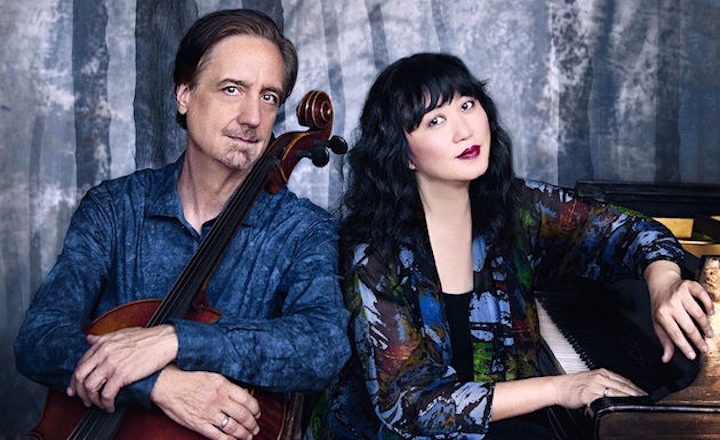 In addition to our careers as concert performers, we serve as the founding Artistic Directors of Music@Menlo, the premier chamber music festival in Silicon Valley, as well as the Artistic Directors of the Chamber Music Society of Lincoln Center (CMS) in New York City. Our main responsibility as concert performers is to give the best concerts we possibly can, and we are constantly striving to achieve the highest possible level of artistry in our performances. In our roles as artistic directors, our responsibilities lie in the programming, casting and designing of concert series and chamber music projects for our organizations. At CMS, this includes designing the programming for our seven different satellite series around the country, plus international partnerships in Taiwan, Korea and Europe. We are also involved in chamber music programming endeavors beyond Music@Menlo and CMS, having just completed a first-ever chamber music residency at the Society of the Four Arts in Palm Beach, Florida. Furthermore, Wu Han is serving as Artistic Advisor to Wolf Trap Chamber Music at the Barns, which entails thematically programming eight concerts per season for the 2018–19 and 2019–20 seasons. 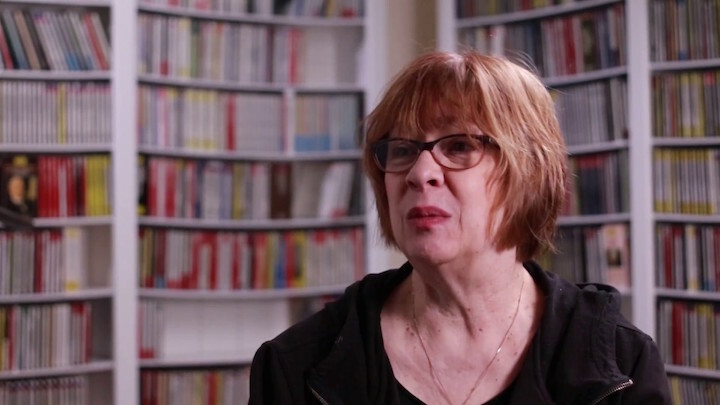 As artistic directors, we spend much of our time putting ourselves in the shoes of our listeners, measuring their experience and receptivity to chamber music of all periods and styles, and putting together the best programs and artists who will move our audiences forward into ever-increasing engagement with and love of the art. 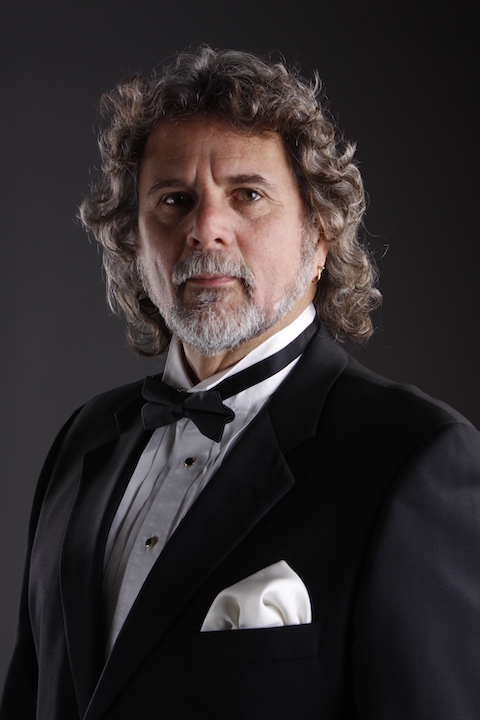 David was the cellist of the Emerson String Quartet for 34 seasons, and we have been performing together as a duo for about 35 years, and continue to do so as one of our main performance activities. What are your personal relationships to the Wisconsin Union Theater, and what do you think of it as a concert venue? Our engagement with the Wisconsin Union Theater goes back quite a few years, but certainly not even close to the beginning of the Theater’s distinguished history. 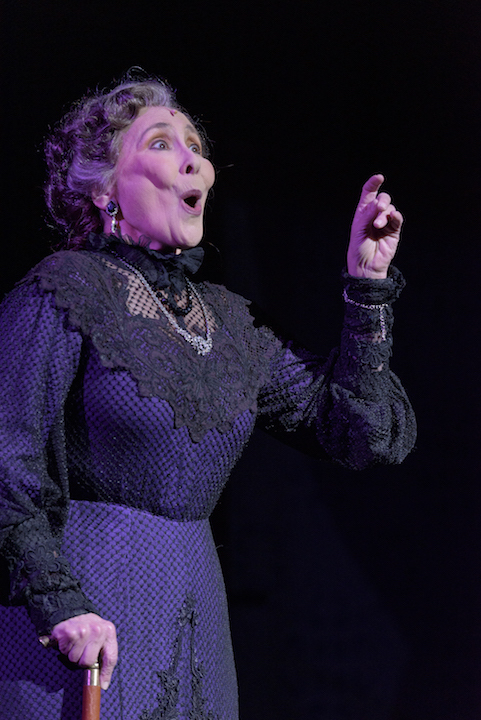 For any performer setting foot on its stage, there’s a sense of slipping into an ongoing tradition of artistic excellence that makes us feel both privileged and obligated to do our best. 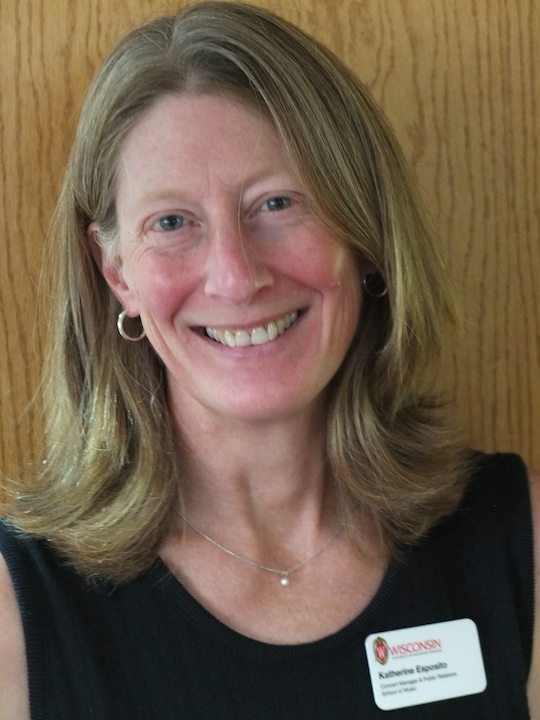 Why did you agree to be artistic advisors and artists-in-residence for the centennial season? Did your personal experiences in Madison play a role in that decision? As seasoned artists, we deeply admire and respect the very special place in the classical music tradition and history that the Wisconsin Union Theater (below) inhabits, and the invitation to participate in the Theater’s 100th anniversary was an honor for us to receive. 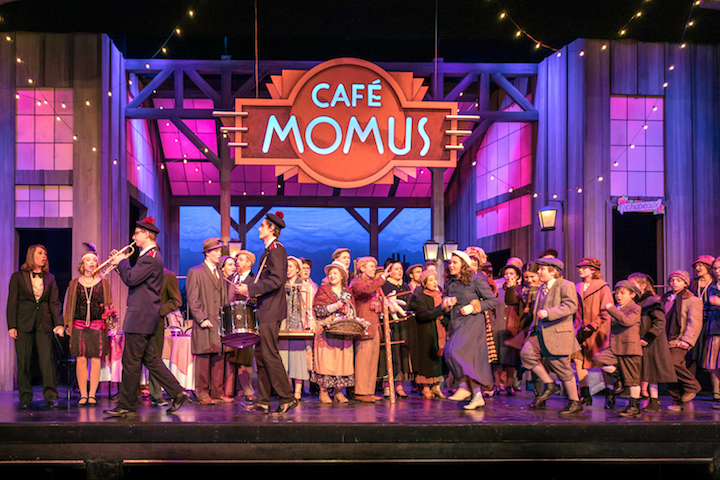 Our experiences playing on this distinguished stage and forming a relationship with the local audience have made our pursuit of the common goal of artistic excellence in the centennial season incredibly fulfilling. Of course, having performed there in the past gave us a hint of confidence through our familiarity with the place, but we must say we have learned perhaps double what we knew originally through this planning process. 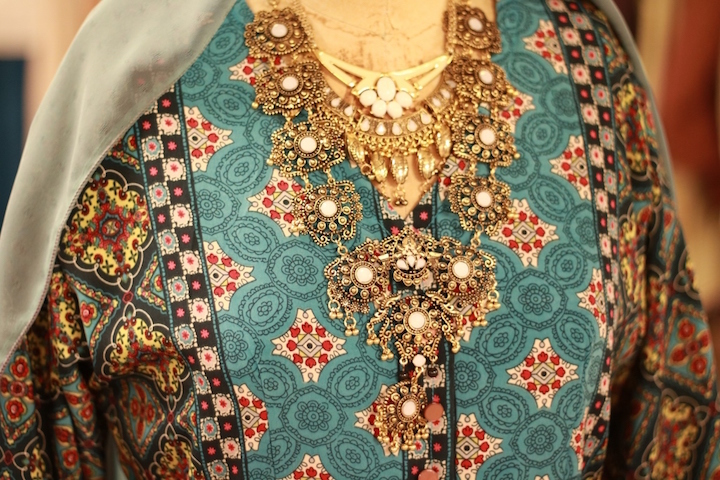 Without interfering, but at the same time sharing our uncompromised commitment to artistic excellence, we hope that our presence during the process has been useful, and we know that we look so much forward to seeing the careful thought and hard work of all involved come to fruition. Is there a unifying or guiding principle to the season you have put together? 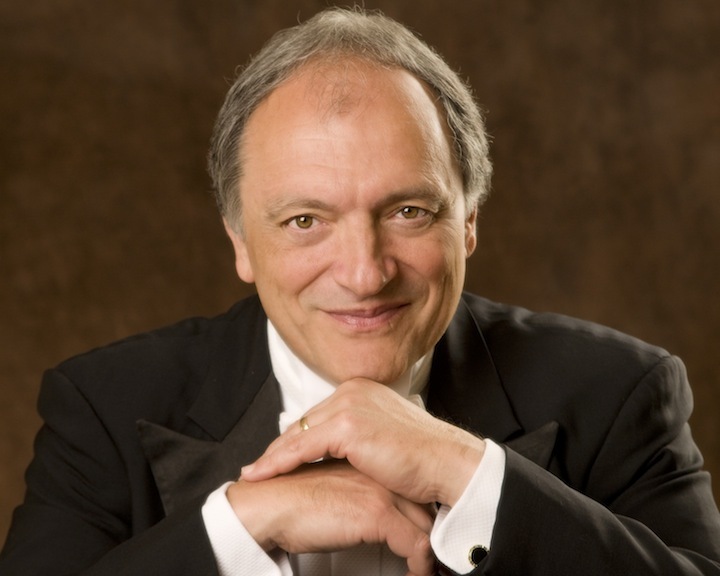 The guiding principle behind our work on this historic season is artistic excellence, which in our opinion is what most inspires audiences and best serves the art form of classical music. Our area of expertise is chamber music, and, as we wanted to share the best of what we can do with the Theater, our focus has been on ensuring that the chamber music offerings during this historic season, and hopefully beyond, reflect the best of the world of chamber music. 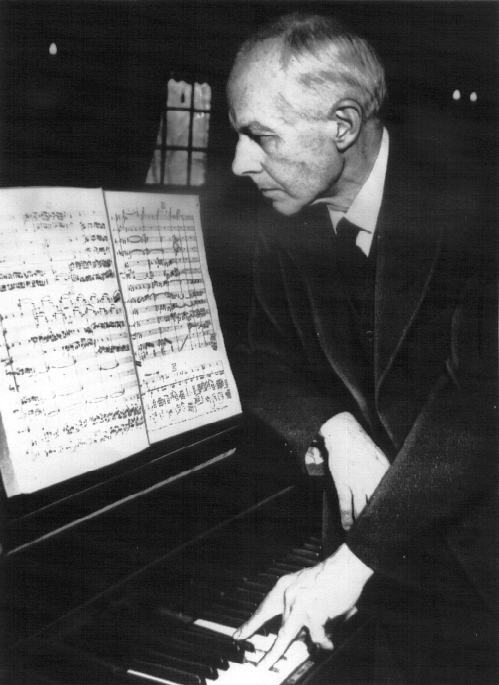 In our suggestions, we looked for variety of instrumentations, of composers and periods—in other words, giving as much of an overview of the art as we could within a season. What would you like the public to know about the Wisconsin Union Theater and the upcoming centennial season? 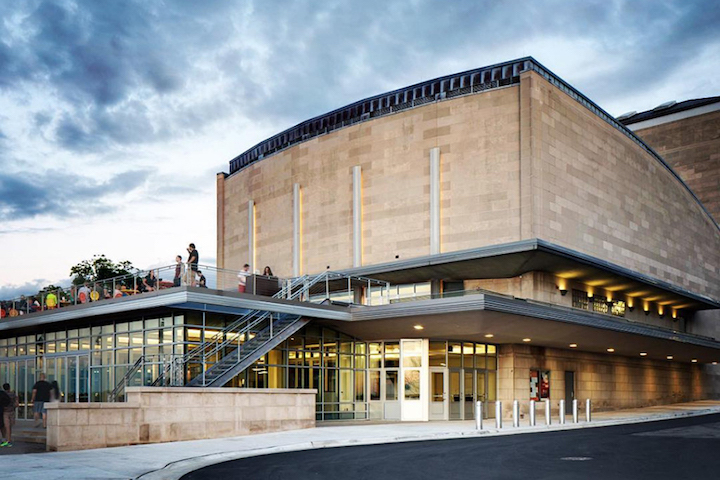 In the Theater’s centennial season, the audience will have the opportunity to savor a variety of different genres of chamber music, from solo piano to vocal music, as well as a sampling of the very best works of the chamber music canon. 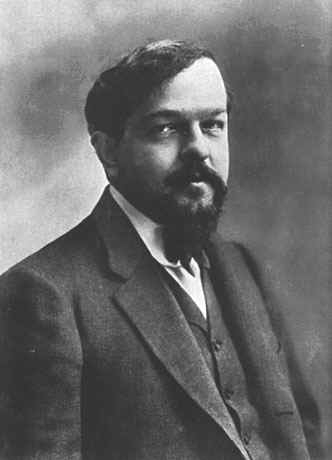 Between these various genres, the great composers left a wealth of chamber music that could sustain the art form on its own, but that’s still only the tip of the iceberg. 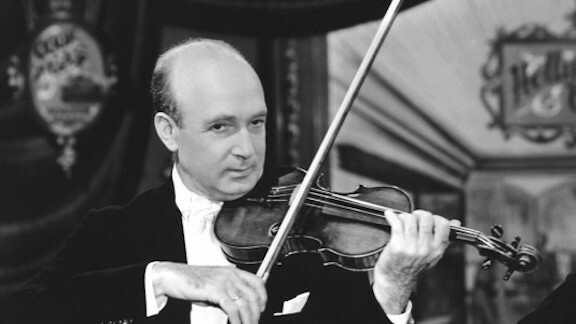 Our chamber music offerings will include the Kalichstein-Laredo-Robinson Trio, which has a long history of performing for the Madison audience. 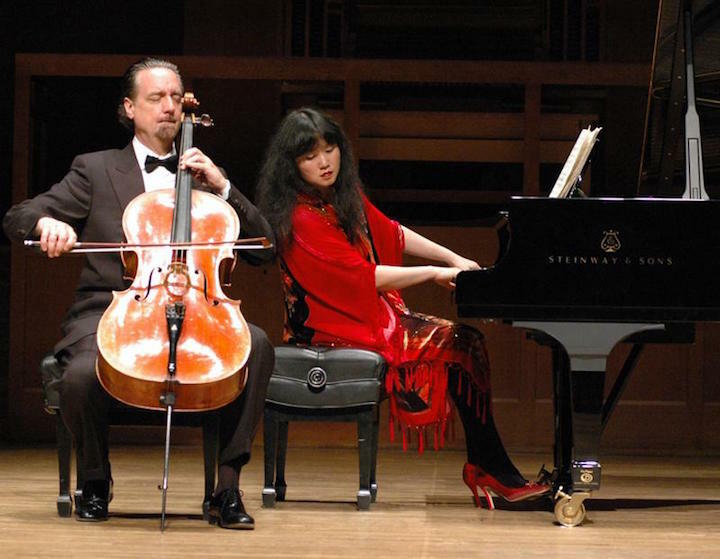 Their December program will include celebrated cornerstones of the piano trio repertoire, including Mendelssohn’s D minor Trio and Beethoven’s “Archduke” Trio. (You can hear the opening of the Archduke Trio in the YouTube video at the bottom.) Both pieces have achieved monumental historical significance through their influence in propelling the art form forward from the Classical period to the Romantic period. The Escher String Quartet performance in January represents the best of the next generation of young string quartets. 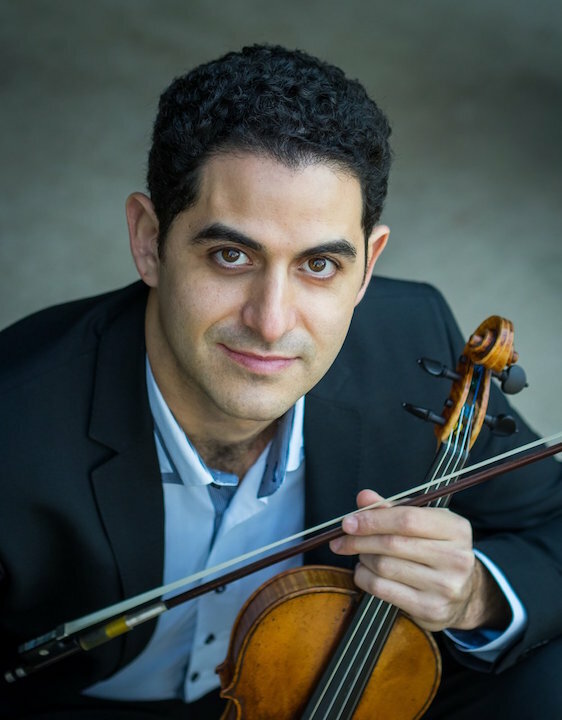 Their program includes a quartet by Franz Joseph Haydn—the father of the string quartet genre—and the sole quartet of none other than revered violin virtuoso Fritz Kreisler, who performed in the Wisconsin Union Theater nearly a century ago. Kreisler set foot on the Theater’s stage numerous times, and his rarely heard string quartet nods to the Theater’s long, distinguished history. 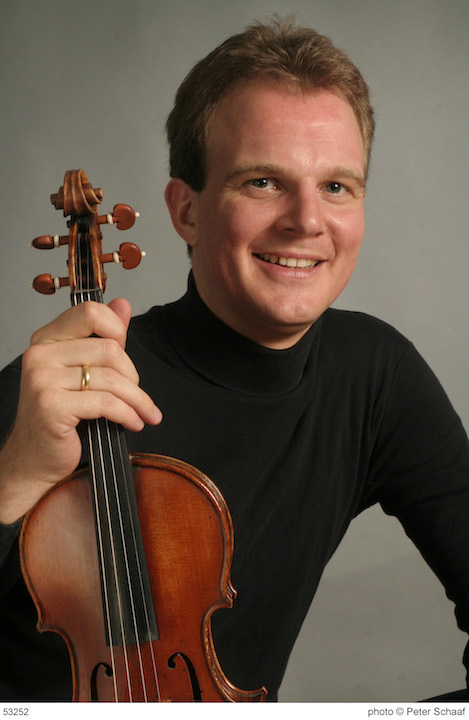 David will join the Escher Quartet for the beloved Schubert Cello Quintet, which is the “desert island” must-have piece for many music lovers. Furthermore, in March, we will bring two of the most fantastic musicians in the world to join us for a program of Antonin Dvorak, Josef Suk and Johannes Brahms. 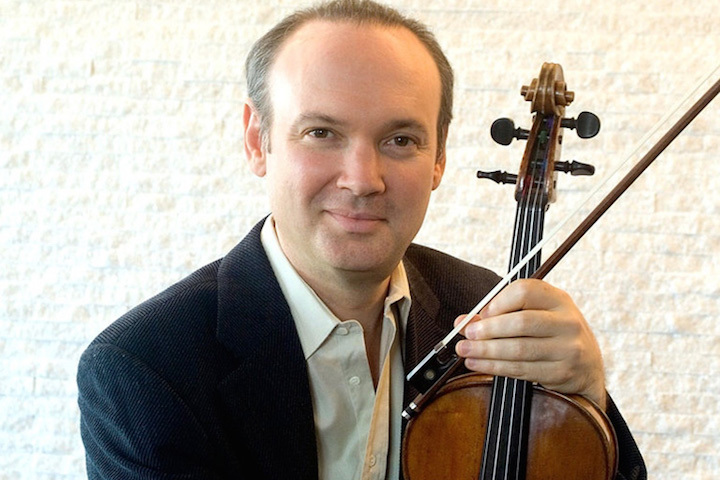 This multigenerational cast of musicians includes the incredible young French violinist Arnaud Sussmann (below top, in a photo by Matt Dine) as well as the most important violist of our generation, Paul Neubauer (below bottom). This program is all about the passing down of the baton and the continuous investment in the next generations of artists: Brahms was the one who discovered Dvorak, and Dvorak in turn discovered Suk. 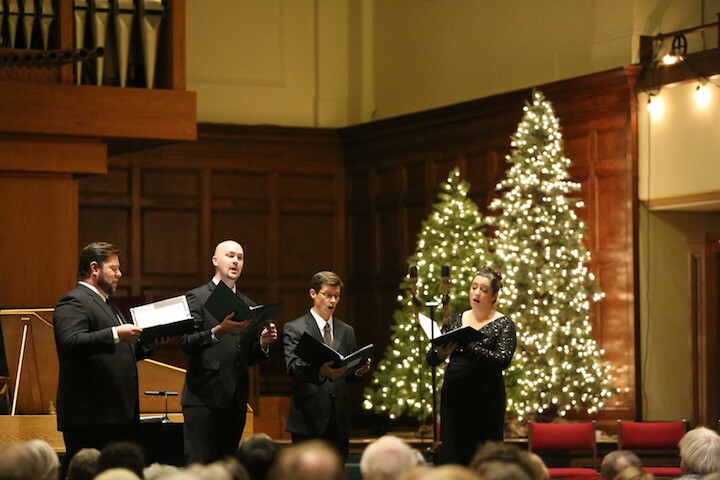 The Madison Bach Musicians will give their eighth annual Baroque Holiday Concert (below in a 2014 photo by Kent Sweitzer) on this coming Saturday night, Dec. 8, at the First Congregational United Church of Christ, 1609 University Avenue, near Camp Randall Stadium. 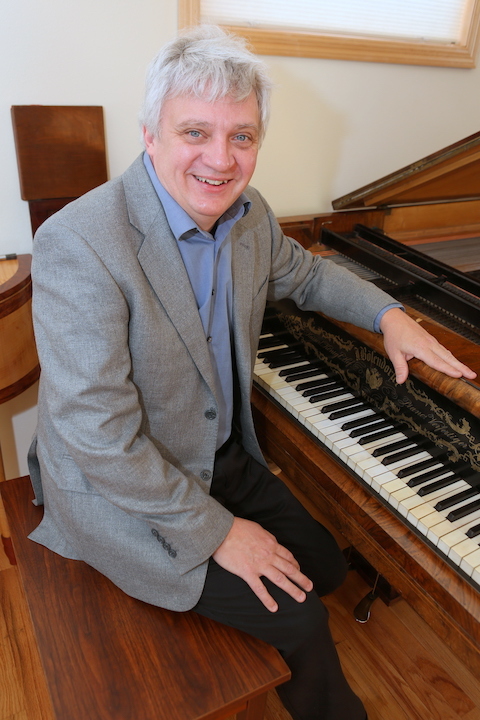 The critically acclaimed and well attended annual concert will follow the usual format with a 7:15 p.m.  lecture by founder, artistic director and keyboardist Trevor Stephenson (below) followed by the concert at 8 p.m.
A critically acclaimed chamber ensemble of voices and period instruments will perform masterworks from the 16th, 17th and 18th centuries. 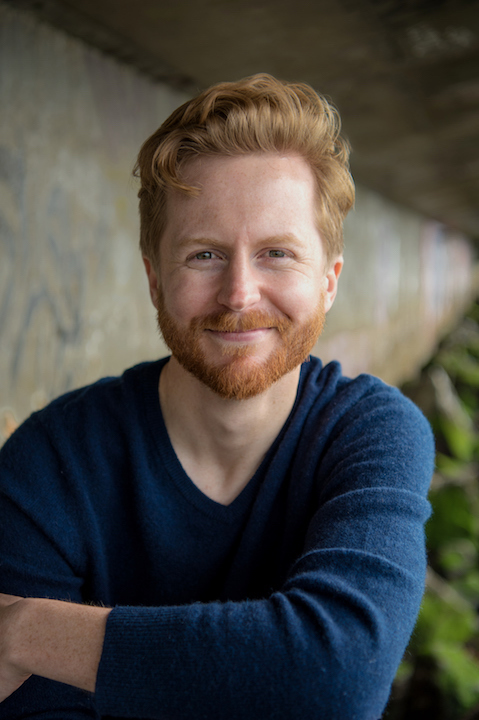 Performers include: Hannah De Priest, soprano; Margaret Fox, mezzo-soprano; Ryan Townsend Strand, tenor; Matthew Chastain, bass-baritone; Arash Noori, theorbo; Katherine Shuldiner, viola da gamba; and Trevor Stephenson, harpsichord. The Ear asked Stephenson: Why are vocal music and Baroque music both so popular during the holiday season? “The program will progress in chronological order from the very early 16th century up to the middle 18th century, from Josquin des Prez to Johann Sebastian Bach. 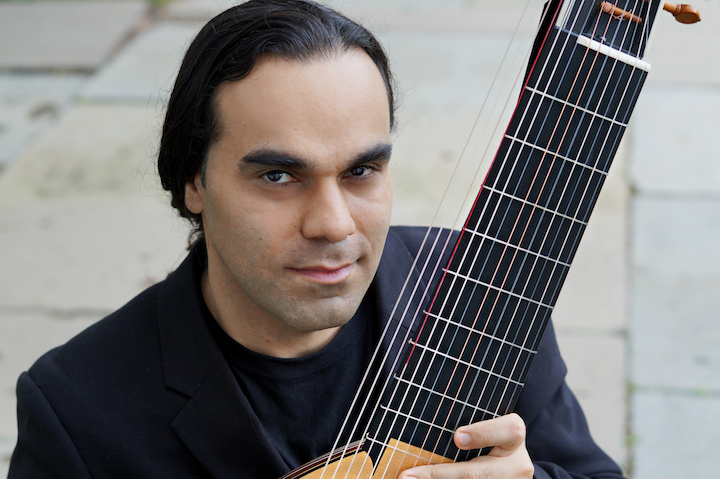 “MBM is thrilled that virtuoso lutenist Arash Noori (below) from New York City will join us for this concert; second on the program, Noori will perform (on theorbo, which is a mega-lute) Niccolo Piccinni’s sparkling Toccata Chromatic and Gagliarda Prima published in the early 17th century. 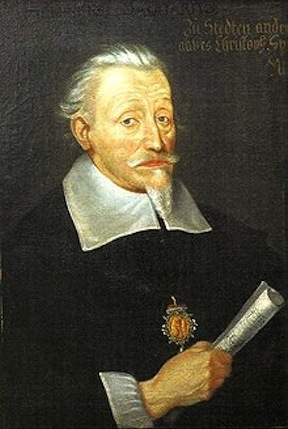 “We’ll follow this with three musical gems for vocal quartet and continuo from the Kleine geistliche Konzerte (Short Spiritual Concerts, 1636−1639) that Heinrich Schütz (below) composed specifically for small ensembles, which were all that were available during the devastation of the Thirty Years’ War (1618−1648). 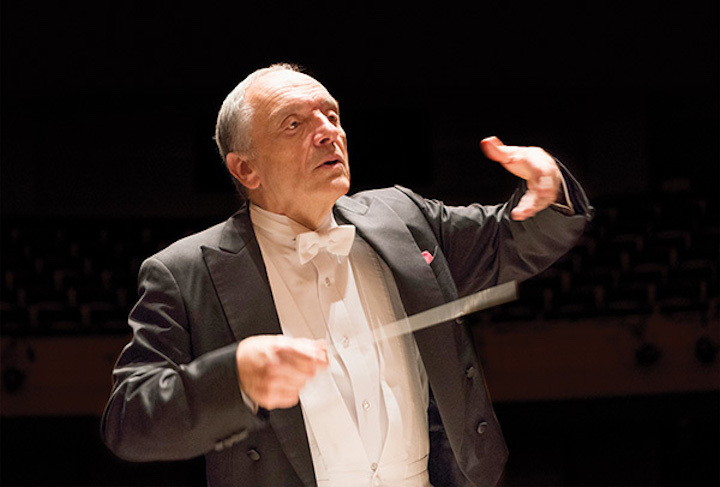 “The second half of the program is devoted to works by Bach. 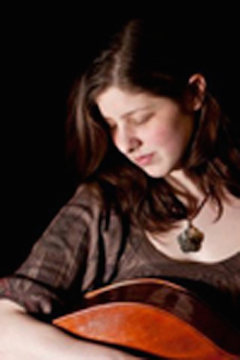 We’ll start with the exquisite Sonata in G major for Viola da Gamba and Harpsichord; gambist extraordinaire Kate Shuldiner (below) from Chicago will be featured and I’ll accompany her at the harpsichord. 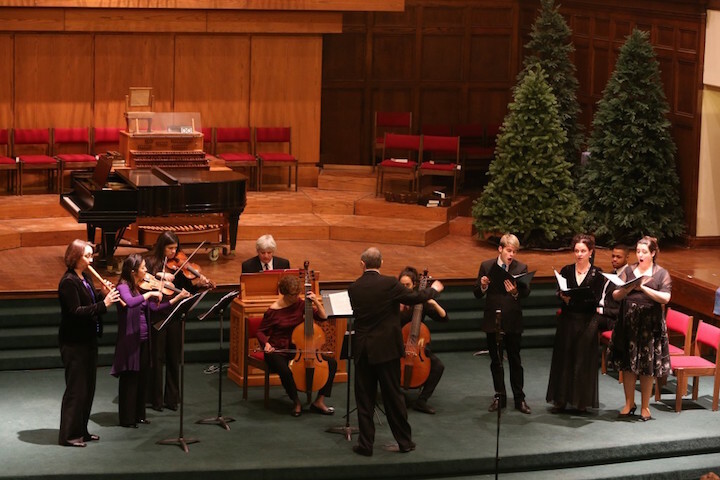 “We’ll follow this with two Christmas songs from the Schemelli Songbook—a collection published in 1736 of more than 60 spiritual songs for which Bach wrote most of the harmonizations and contributed several great original tunes to boot. 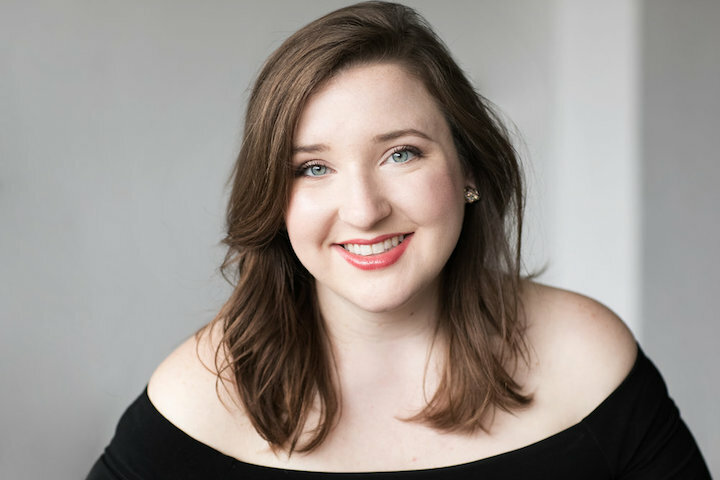 “Soprano Hannah De Priest (below top) and mezzo-soprano Margaret Fox (below bottom) will be featured in the bouncy and charming duet, Wir eilen mit schwachen, doch emsigen Schritten (from Cantata 78, “We hasten, with weak, yet eager steps, O Jesus, O Master, to You, for help!”), which you can hear in the YouTube video at the bottom.) Bach not only worshipped God, but also felt comfortable enough in the relationship to occasionally party; this work is an ingenious fusion of high art and polka romp! Advance-sale discount  tickets are $30 general admission. Tickets are also available at  Orange Tree Imports and the Willy Street Coop East and West. Tickets at the door are  $33 for general admission, $30 for seniors 65 and over. Student Rush tickets are $10 and will be on sale 30 minutes before the 7:30 p.m. lecture. 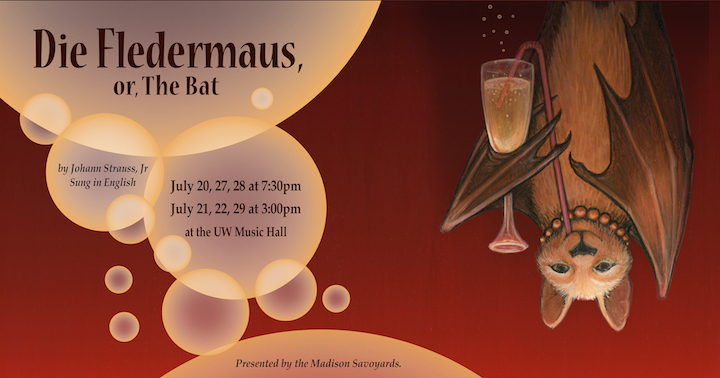 Starting this weekend, the Madison Savoyards presents Die Fledermaus, or The Bat, by Johann Strauss Jr. — sung in English with supertitles — at UW Music Hall at the base of Bascom Hill. Evening performances are on Friday, July 20; Friday, July 27; and Saturday, July 28; matinees are at 3 p.m. on Saturday, July 21; Sunday, July 22; and Sunday, July 29. Ticket prices are $30 for the public; $28 for seniors; $15 for students and youth under 17; and $5 for children under 5. Tickets can be purchased through UW Box Office at (608) 265-2787, www.arts.wisc.edu, or in person at the door. Group sales of 10 or more available by telephone only. The production marks the 55th anniversary of the Madison Savoyards, best known for presenting the operettas of Gilbert and Sullivan. 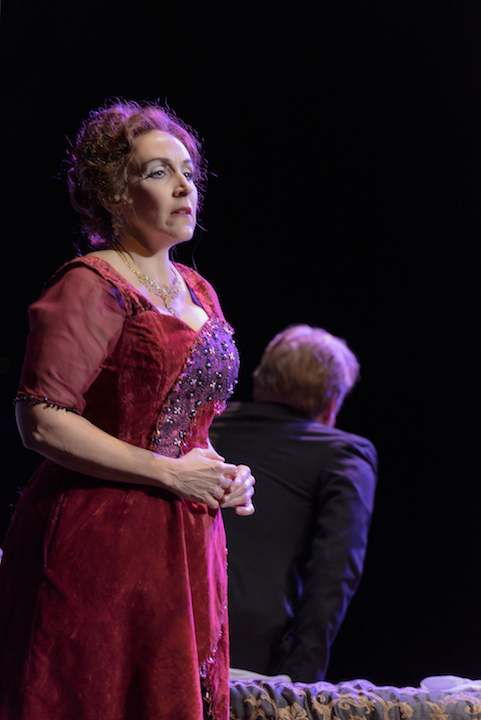 Die Fledermaus is the story of a romantically stale couple that learns to love again all the while playing the fools in this comedy of errors. Eisenstein and his wife Rosalinda, fall prey to a cruel joke by their old pal Falke involving their chambermaid, a Russian prince, a prison warden and a tenor who can’t get the girl. Everyone works his or her way up and down the social ladder in this futuristic production set in 2021. The famous second act masquerade ball is a menagerie theme featuring a ballet performance by Central Midwest Ballet Academy of Middleton. 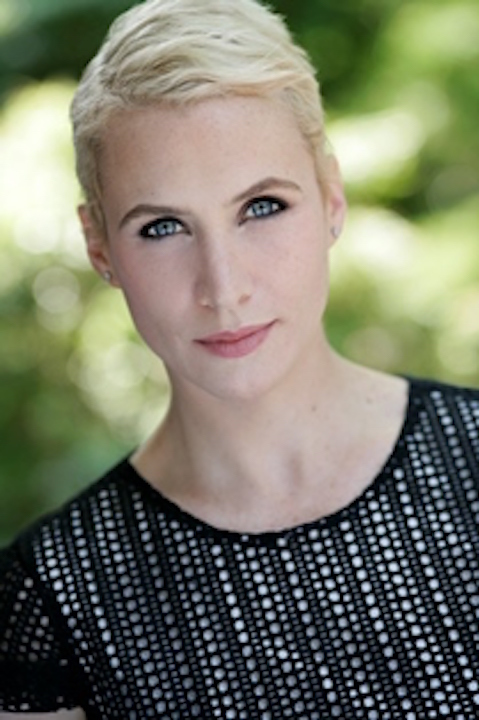 The choreographer is Kristin Roling, with costumes by Rebecca Stanley and set design by Corey Helser. 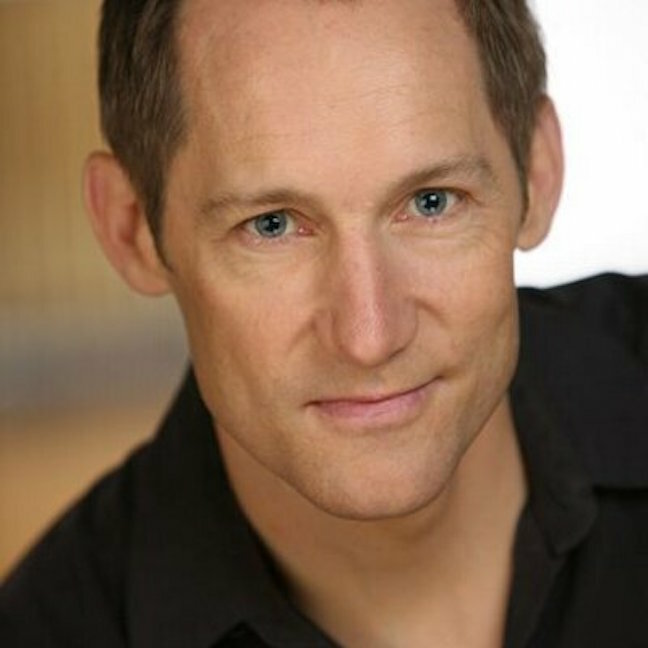 The cast includes Tim Rebers (below top) as Eisenstein and Erica K. Bryan (below bottom) as Rosalinda. Also featured are Michelle Buck (below top) as Adele; Ben Swanson (below second) as Falke; Kirsten Larson (below third) as Prince Orlofsky; and Tom Kastle (below bottom) as Frosch. Grant funding supports the artists and underwrites the Children’s Pre-Show (1 p.m. on July 22 at UW-Madison’s Music Hall) where children will meet members of the cast and crew, and learn about the show and its music, tour the theater, and create a show-centric craft for free. American Sign Language service is available, by request, for the July 21 performance. More information can be found on the company’s Facebook page along with behind-the-scenes insights to the production. 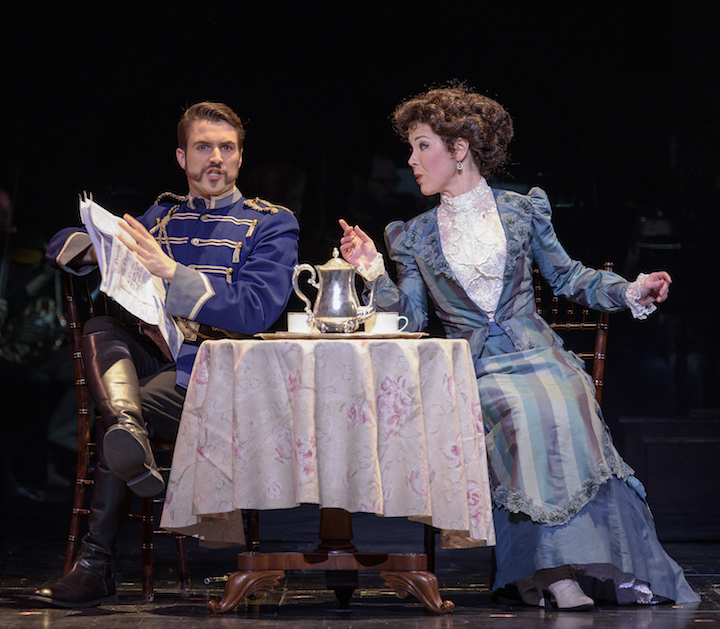 Why does the anniversary production feature Johann Strauss Jr. rather than Gilbert and Sullivan? “We decided to celebrate our 55th anniversary with Die Fledermaus to try something new as a company. Strauss Jr.’s Fledermaus is always a party and will elevate our audiences in the same ways as they have come to expect with G&S. 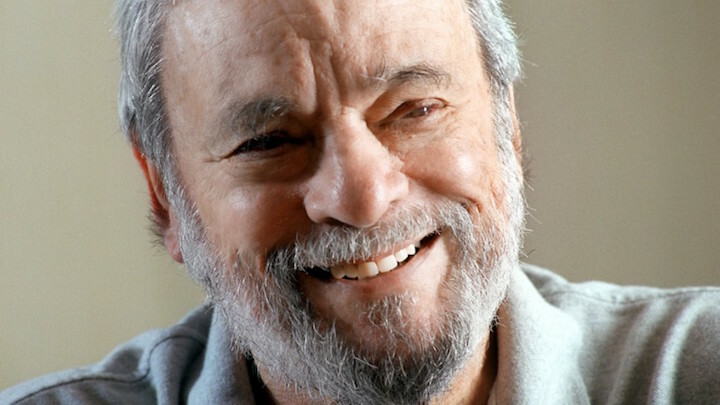 “We have actually continued our tie to G&S by choosing a libretto that is based upon Gilbert’s translation of the original Meilhac and Halevy play, Le Réveillon. Gilbert’s On Bail brandishes the same humor, socio-political commentary, and alliterative patters we expect from his pen. It only seemed logical to use a translation steeped in Gilbert’s. 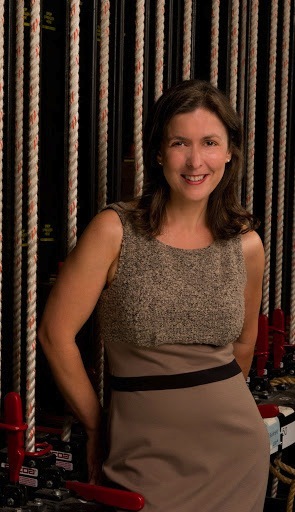 “Additionally, our company has performed nearly every work in the G&S collaborative canon — the only exceptions being the reconstructed Thespis & Pineapple Poll — and we want to see how the community embraces us peppering in other light opera and operettas into our repertoire. Some celebrate 55 years with emeralds; we’re celebrating with love… and a twist! “The story of Fledermaus really did not need a ton of punching up to meet the year. For fun we have included Wisconsin references like Spotted Cow beer, cheese curds (my personal favorite), and Old Fashioneds, which enliven the second act even more, but the core of the story is timeless. “Whether told with Viennese costumes, or modern attire and cell phones, this story could happen anytime, anywhere. People still play practical jokes on one another, people escape to costume parties for fun, and lovers still fall in, and maybe out, of love. Why did you choose to do it in English? 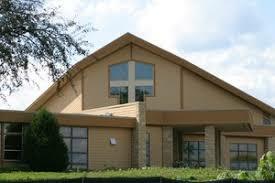 “The Madison Savoyards is dedicated to continuing the tradition of performing in English. 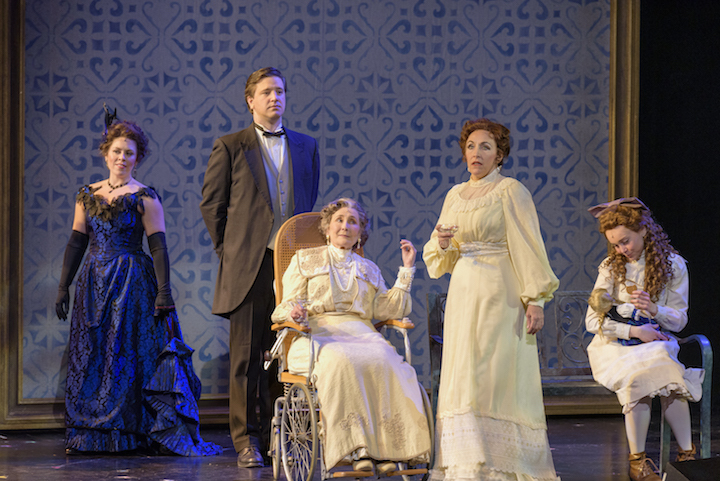 It offers accessibility to our audiences that larger operatic works sometimes cannot. Plus, light opera historically is offered in the vernacular of wherever it’s performed. “Likewise, we are continuing to offer comedic works as the core of our repertoire. 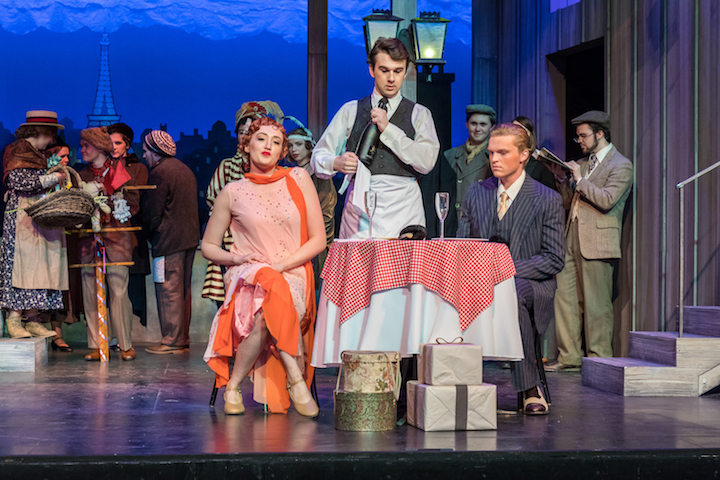 The Opera Guy for The Ear went to the University Opera’s performances of “La Bohème” on Friday and Saturday nights so he could sample both student casts. 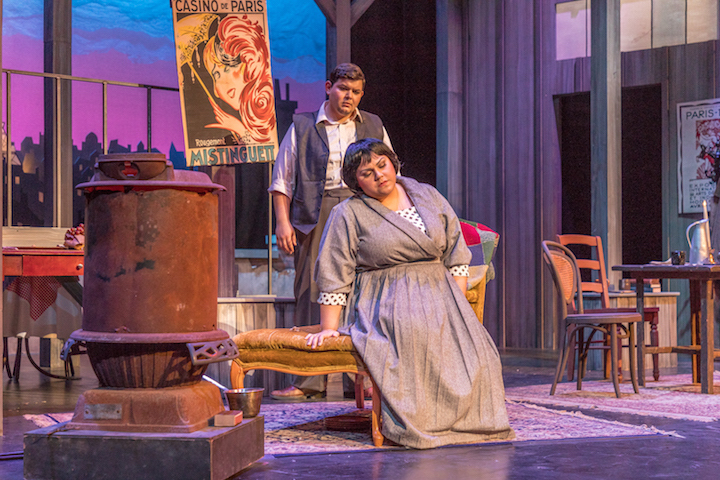 He filed this review, which is accompanied by photos taken by Michael R. Anderson for the University Opera. 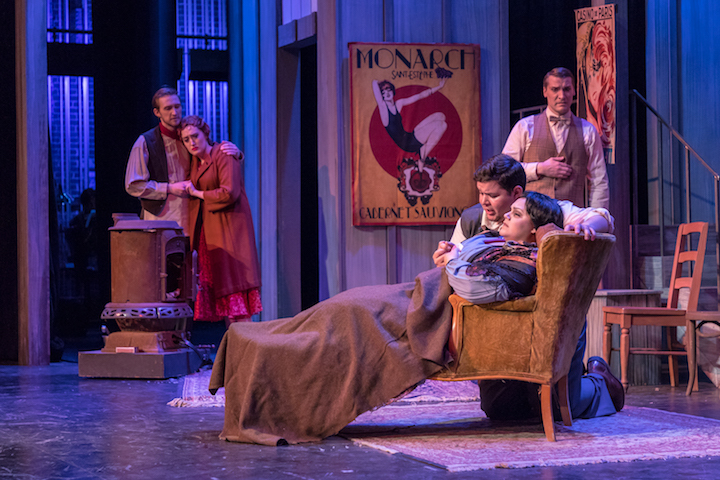 I attended the first two of the three performances of University Opera’s production of Puccini’s “La Bohème.” This production made use of the expansive and technically advanced Shannon Hall in the Wisconsin Union Theater. Deservedly, the hall was nearly full for both of the performances I attended. Director David Ronis decided to update the setting to Paris in the mid-1920s primarily using posters, wigs and wonderful costumes to suggest the decade. Joseph Varga’s beautiful and clever single set incorporated ingenious slight changes act by act to suggest the opera’s various settings. Along with Sruthi Suresan’s subtle lighting design, the production was a visual delight. Ronis’ able hand was evident in the players’ acting. The cast was consistently believable, and consequently I was drawn into their world and suffered along with their despair over love’s inconsistencies and death’s sting. Using my acid test for a performance’s success, I never glanced at my watch either night. I was fully engaged. The orchestra was a marvel. 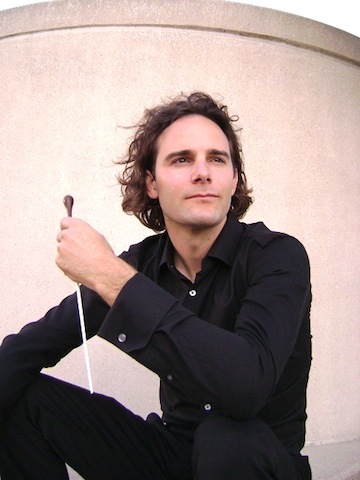 Conductor Chad Hutchinson let it soar when it was appropriate, but the orchestra never overshadowed the singers. In fact, the key term that kept occurring to me both evenings was balance. The acting, the back-and-forth between the singers, and the interplay between the orchestra and the singers were consistently evenhanded. 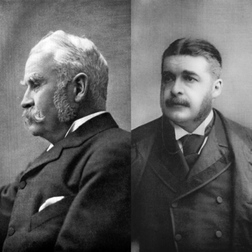 As for the singers, the primary roles were double cast. 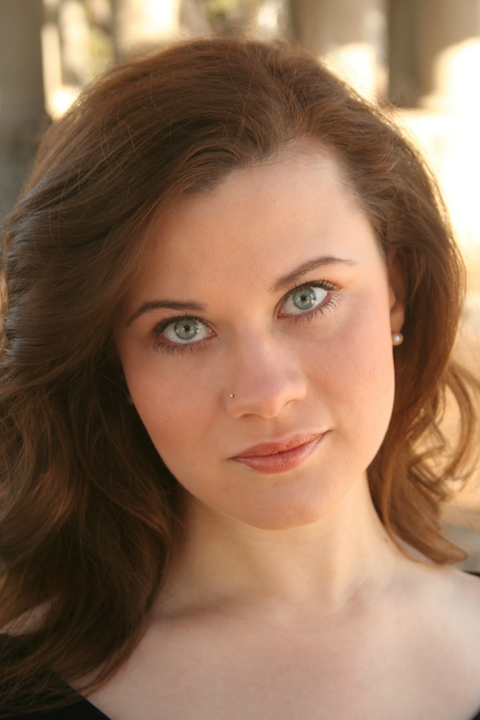 Friday’s Mimi was Shaddai Solidum whose first aria “Mi chiamano Mimi” was a lesson in the mastery of legato. 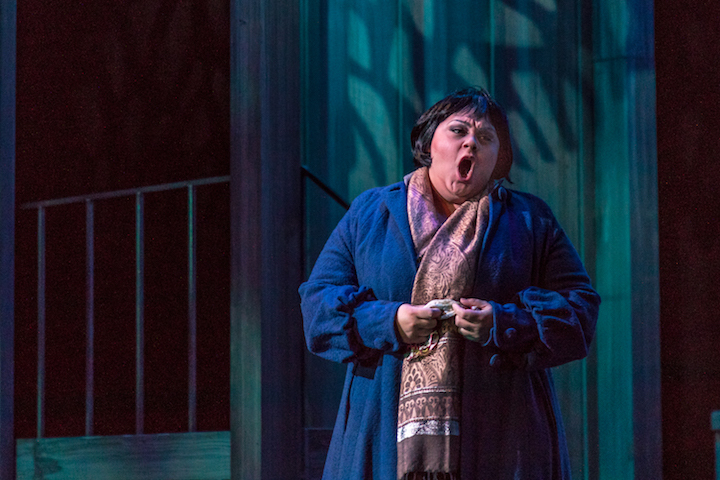 Saturday’s Mimi was Yanzelmalee Rivera who possesses a bell-like voice of remarkable agility. Matt Chastain’s Marcello was dark and brooding while James Held’s was more carefree and pragmatic. Both were able singers, and I found their ensemble work exceptional. In fact, the duets, trios, quartets and ensemble scenes throughout the opera were uniformly terrific. 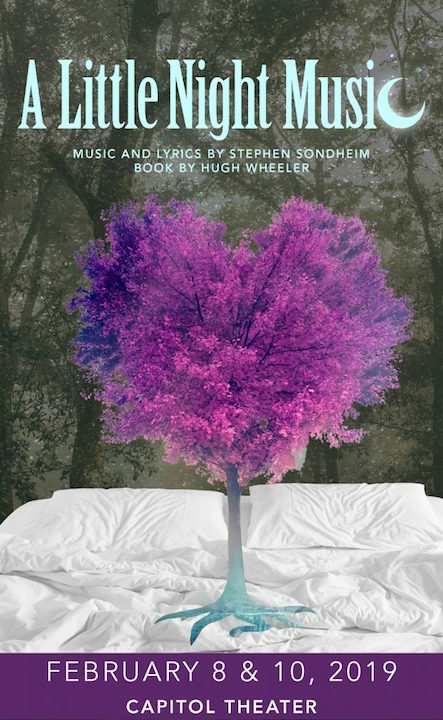 The program lists “Into the Woods” as University Opera’s production next spring in conjunction with the UW theater department. Although I personally look forward to it, I wonder about the blurring between opera and musical theater. 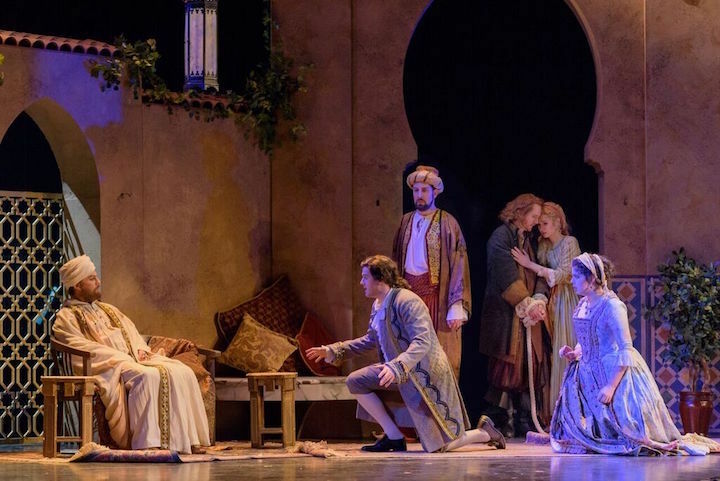 This weekend, the Madison Opera presents The Abduction from the Seraglio by Wolfgang Amadeus Mozart on Friday, Feb. 9, at 8 p.m. and Sunday, Feb. 11, at 2:30 p.m. in the Capitol Theater at the Overture Center for the Arts, 201 State Street. 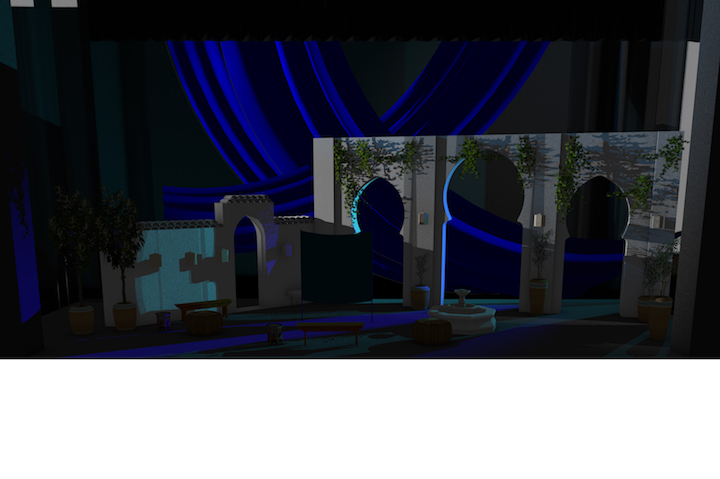 According to a press release, the opera — below is a mock-up of the locally designed and constructed set — will be sung in German with English used for dialogue and in the translated supertitles above the stage. Running time is about 2-1/2 hours with one intermission. With some of the most virtuosic vocal writing by Mozart (below), the opera is an adventure story of love, danger, humor and humanity. 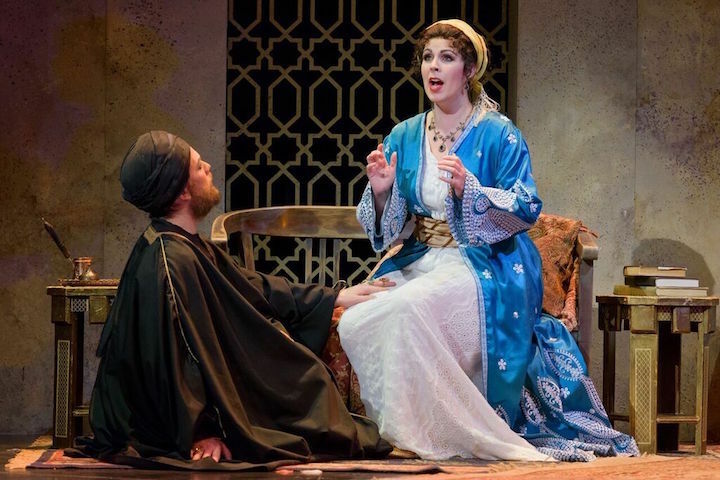 Set in the 17th-century Ottoman Empire, the opera begins when Belmonte, a Spanish nobleman, arrives at Pasha Selim’s palace to rescue three people who had been captured during a shipwreck: his fiancée, Konstanze, and their servants, Blonde and Pedrillo. A simple escape proves no easy task, and Mozart’s masterpiece weaves together comedy, quiet reflection and youthful optimism, with a happy ending brought about by an Enlightened ruler. 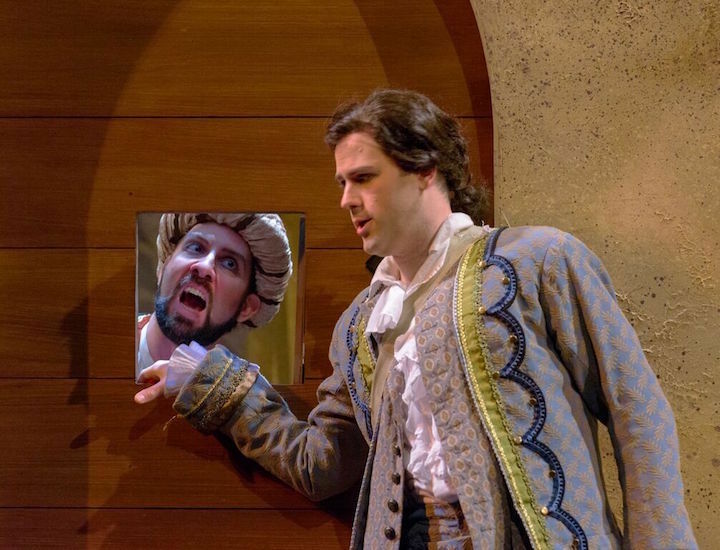 Like all singspiels, the opera uses spoken dialogue; indeed, the critical role of Pasha Selim is entirely spoken, perhaps one of the few instances of a major opera character not singing a note. In Madison, the dialogue will be performed in English, with the music sung in German (with projected English translations). With a libretto by Johann Gottlieb Stephanie the Younger – an unauthorized adaptation of a libretto by Christoph Friedrich Breztner – Abduction was one the first successful German-language operas. 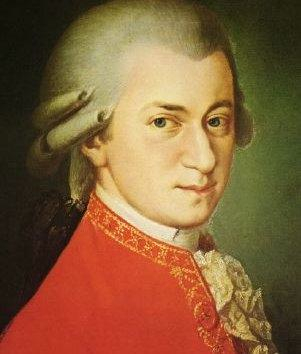 Abduction would go on to become Mozart’s most popular opera during his lifetime, but it has been a comparative rarity in the United States. 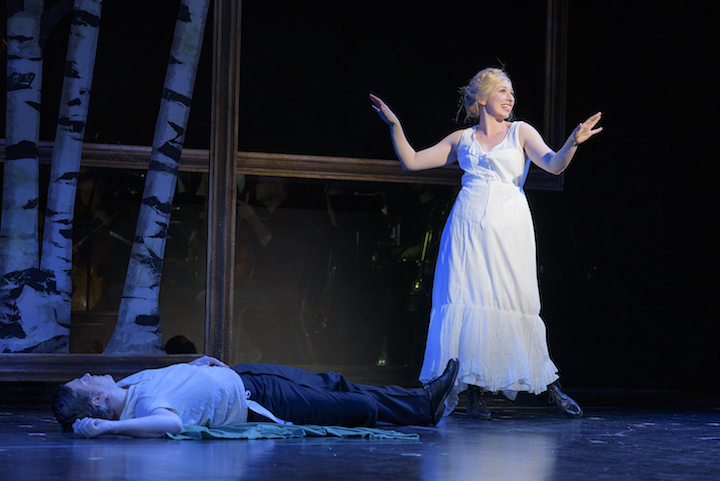 This is Madison Opera’s first production of the opera in the company’s 57-year history. 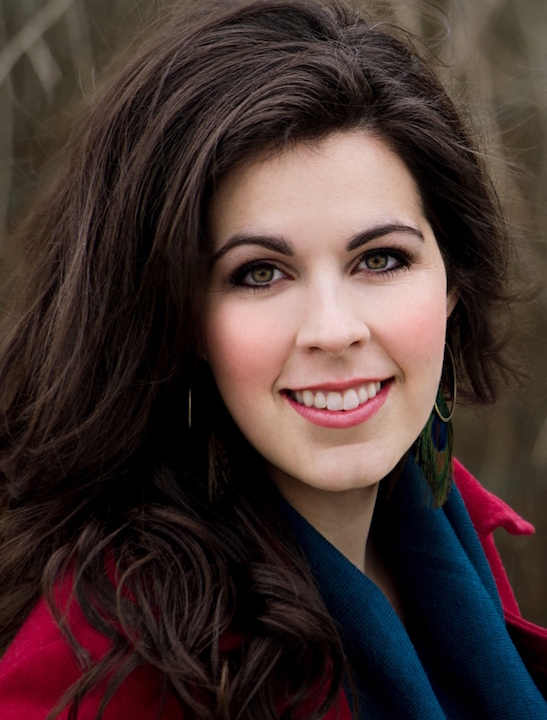 Mozart’s phenomenal vocal writing requires a strong team of five singers, and Madison Opera’s cast features a number of returning favorites. 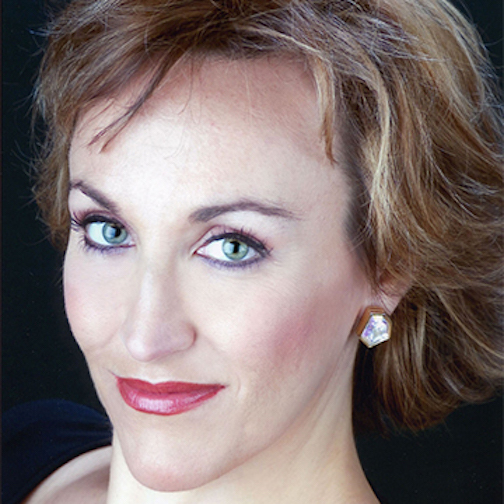 Amanda Woodbury (below) sings the Spanish noblewoman Konstanze, whose aria “Martern aller Arten” is one of the most challenging arias ever written. 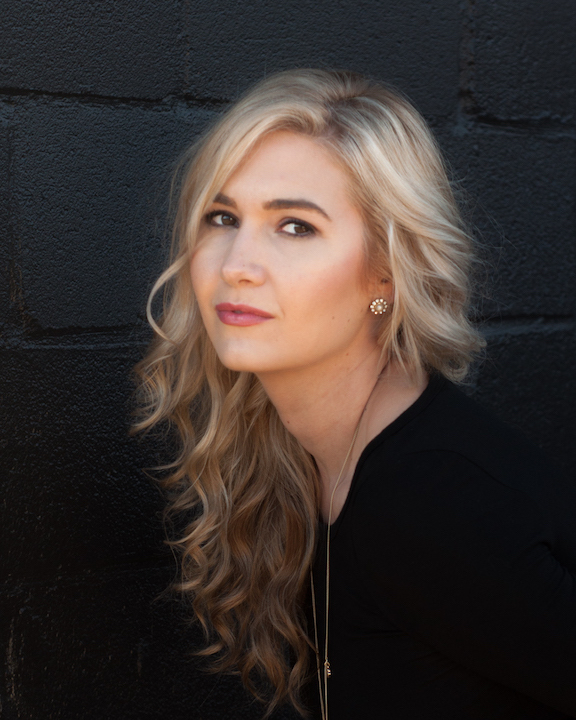 Woodbury debuted with Madison Opera as Pamina in The Magic Flute last spring, and has recently sung leading roles for the Metropolitan Opera and Los Angeles Opera. 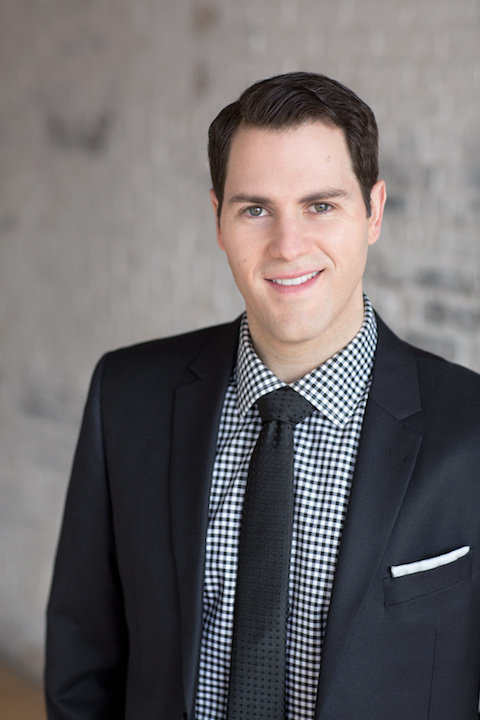 Tenor David Walton (below) sings Belmonte, Konstanze’s fiancé; he debuted at Opera in the Park this past summer, has sung many leading roles for Minnesota Opera, and sings at the Glimmerglass Festival this summer. 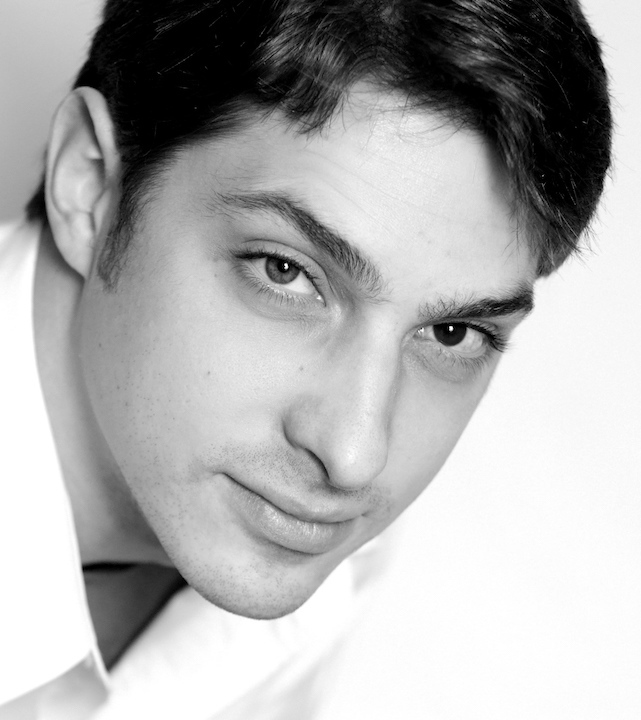 Matt Boehler (below) returns as Osmin, the palace overseer with some devilishly low bass notes. 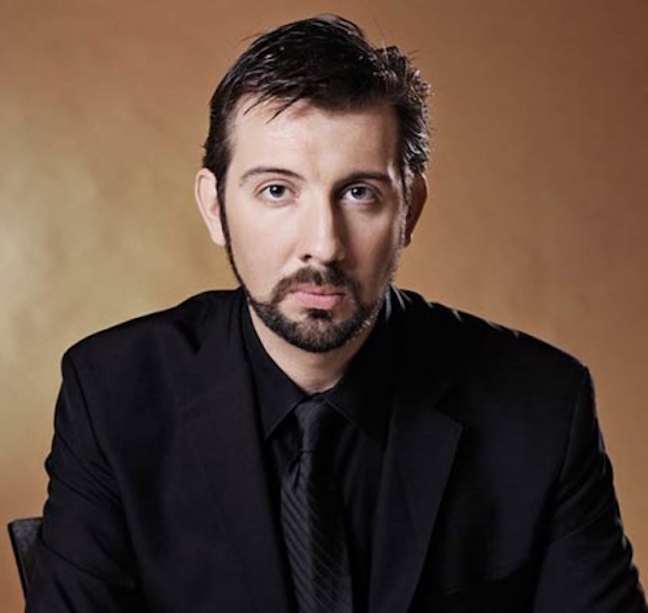 He sang Rocco in Fidelio and Leporello in Don Giovanni for Madison Opera, and more recently has sung with Minnesota Opera, Opera Philadelphia, and the Canadian Opera Company. 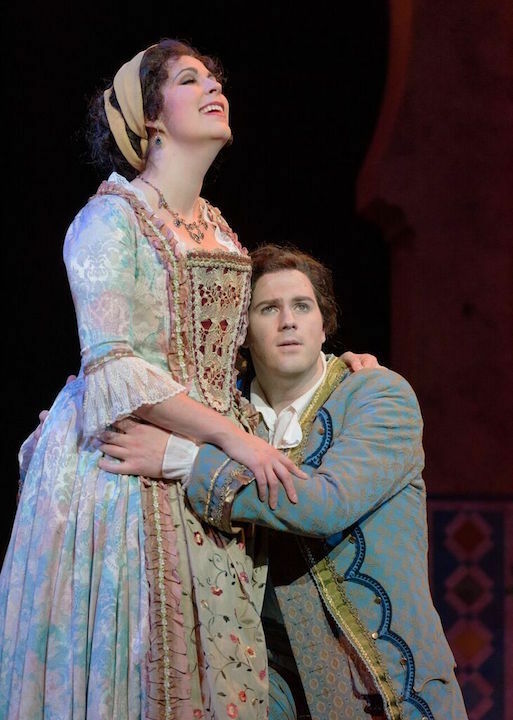 Konstanze and Belmonte’s servants, Blonde and Pedrillo, are sung by Ashly Neumann(below top) in her Madison Opera debut and Wisconsin native Eric Neuville (below bottom), who sang Laurie in Little Women for Madison Opera. 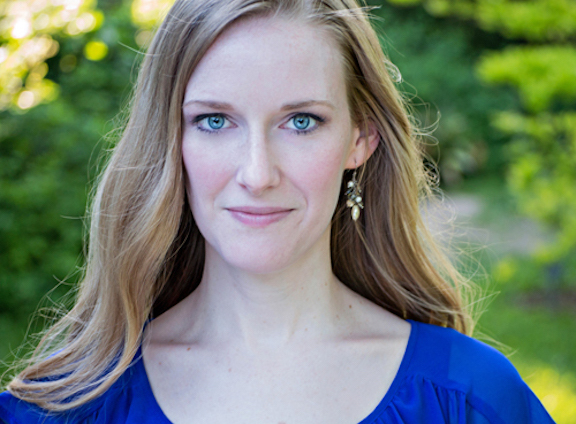 Alison Mortiz (below) directs this new production in her debut with Madison Opera. 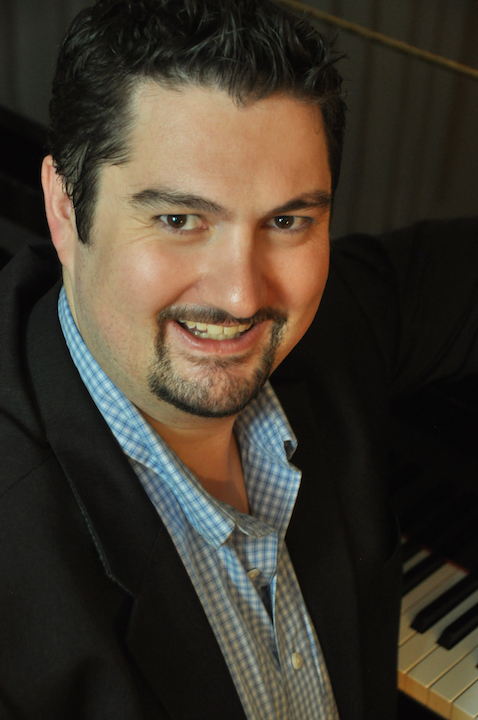 Moritz has directed at opera companies around the United States, including Central City Opera, Tulsa Opera and Tri-Cities Opera. 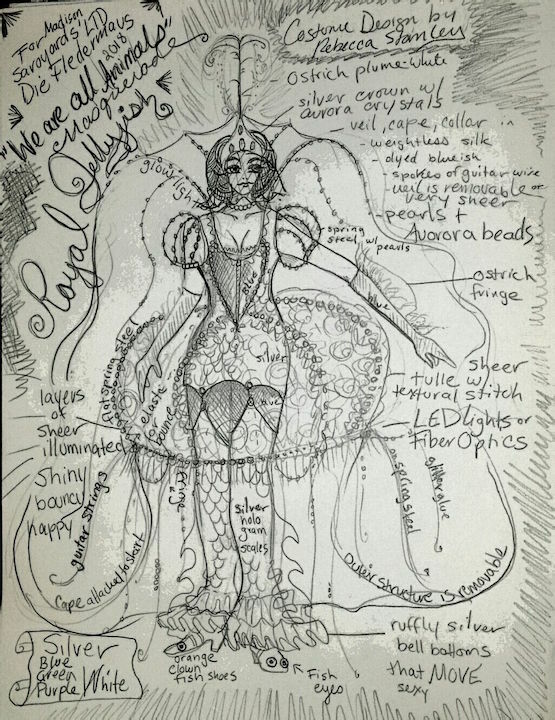 The sets and costumes (below) are locally made specifically for this production. 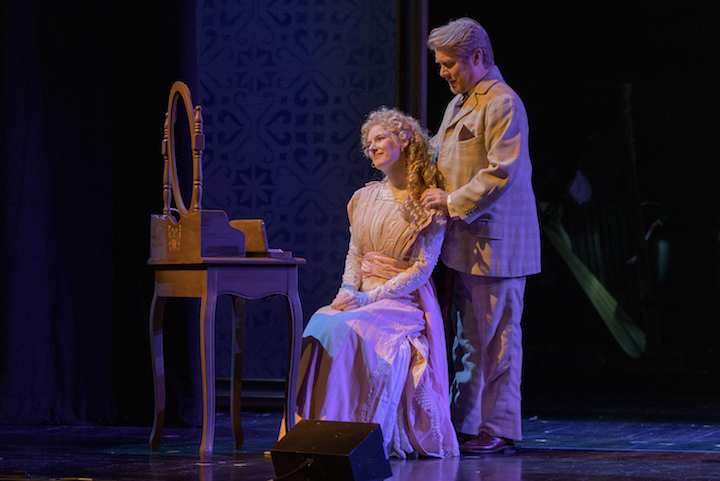 The scenery and lighting are designed by Anshuman Bhatia, also in his Madison Opera debut, with costumes designed by Karen Brown-Larimore. As always, the opera features the Madison Opera Chorus and the Madison Symphony Orchestra. 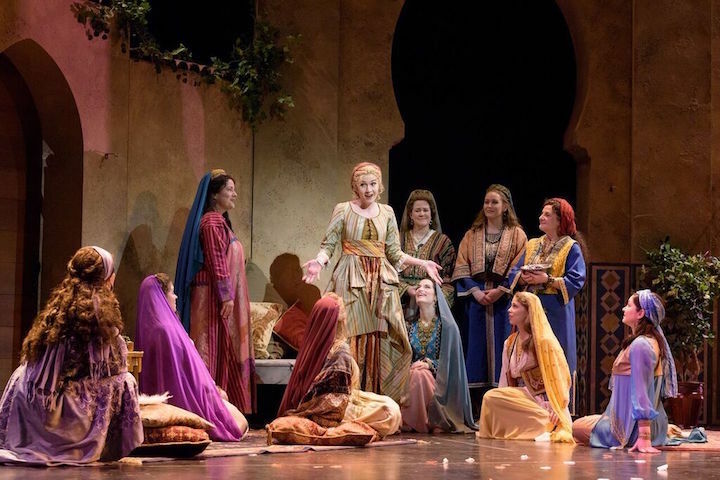 Madison Opera’s production of The Abduction from the Seraglio is sponsored by Kay and Martin Barrett, Fran Klos, Sally and Mike Miley, and the Wisconsin Arts Board. Although the UW-Madison officially opened yesterday, today is the first day of instruction. 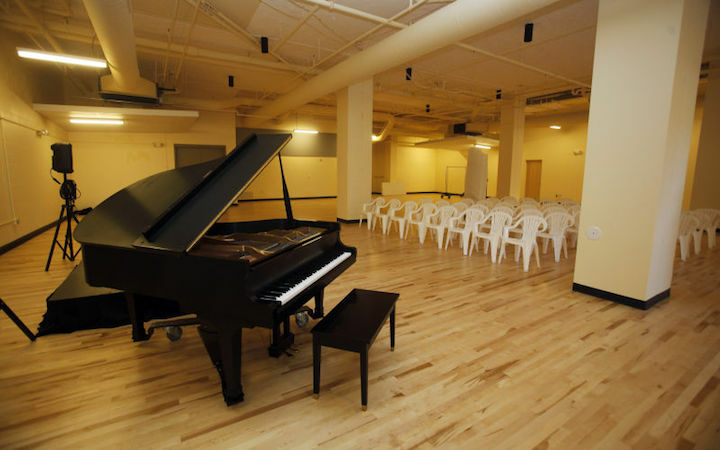 And this weekend will see the beginning of the new concert season at the Mead Witter School of Music. 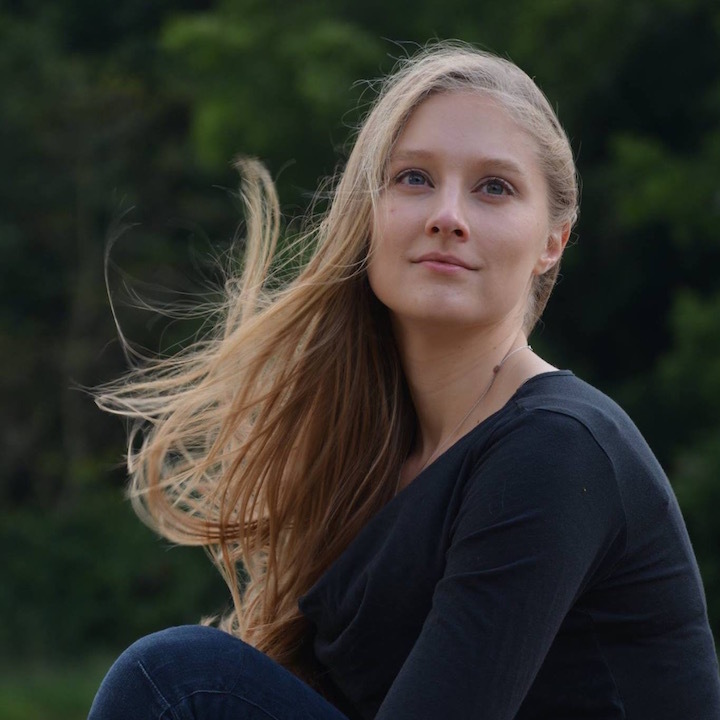 On Sunday afternoon at 1:30 p.m. in Morphy Hall, faculty soprano Mimmi Fulmer and alumnus pianist Thomas Kasdorf will kick off the season with a FREE concert of music and songs celebrating the 100th anniversary of the independence of Finland. 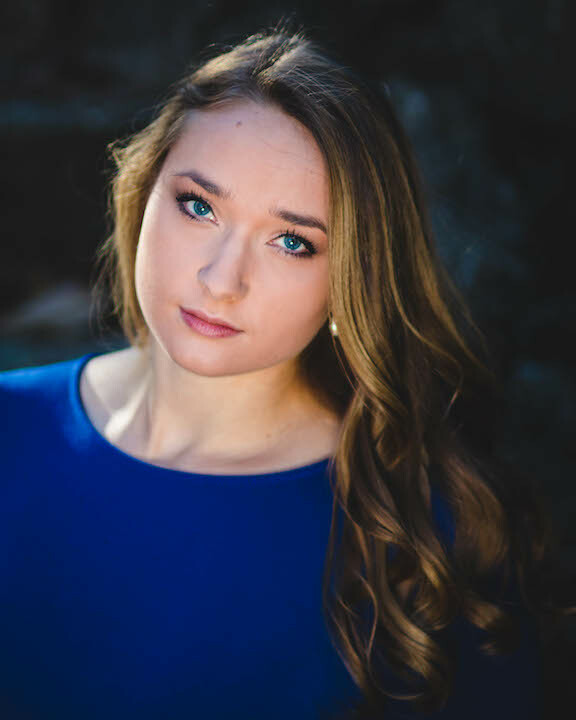 But that’s just the beginning to an event-filled school year that includes mostly free solo recitals, chamber music, orchestral music, opera, choral music and more. 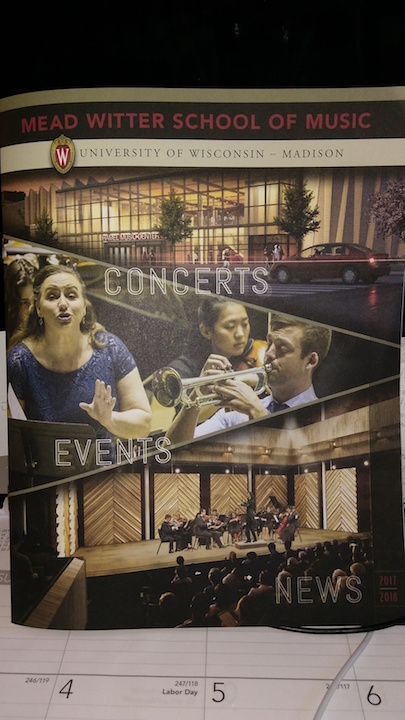 And this year, there is a new guide to the concert season and the School of Music itself. 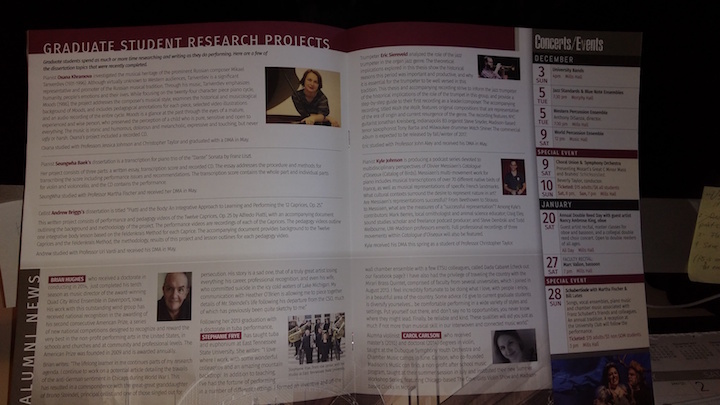 The short and usual glossy brochure of listings has given way to a booklet guide. It is 8-1/2 by 11 inches big and has 24 well-filled pages. It is printed on regular paper and has much more information about the events and the people who make them happen. It takes you behind the scenes as well as in the hall and on the stage. It is less showy, to be sure, but so much more readable and informative. And it feels great in your hands. On the right hand margin, you’ll find concerts with performers and programs. To the left and in the center, you will find news, biographies and other information about musicians, donors and an update about the new concert hall building. 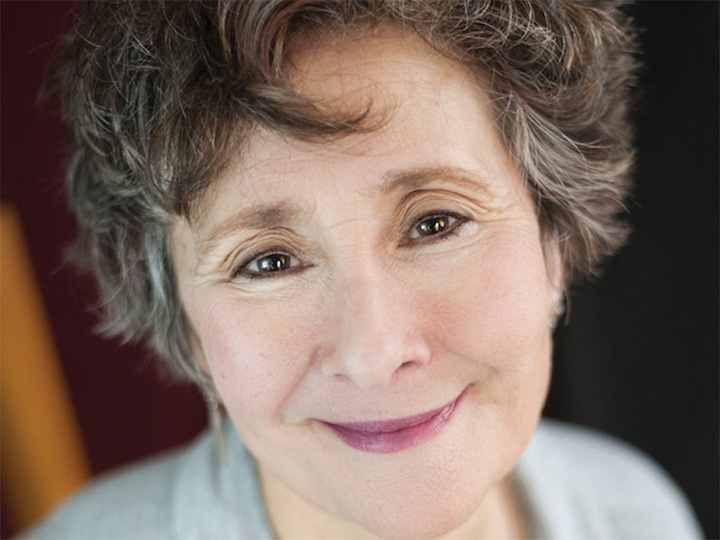 The new guide, which you can get for FREE, is the brainchild of Kathy Esposito (below), the music school‘s publicist and concert manager. “Our School of Music website, which debuted in 2014, required resources that previously had been devoted to multiple print publications. “So we dropped back to only one, a printed events calendar. “I’m happy to say that for the 2017-18 academic year, we finally found time to enlarge the printed concert calendar into a true newsletter as well. “We certainly have enough news to share. Much of what’s in there had not been, or still is not, placed on the website at http://www.music.wisc.edu. 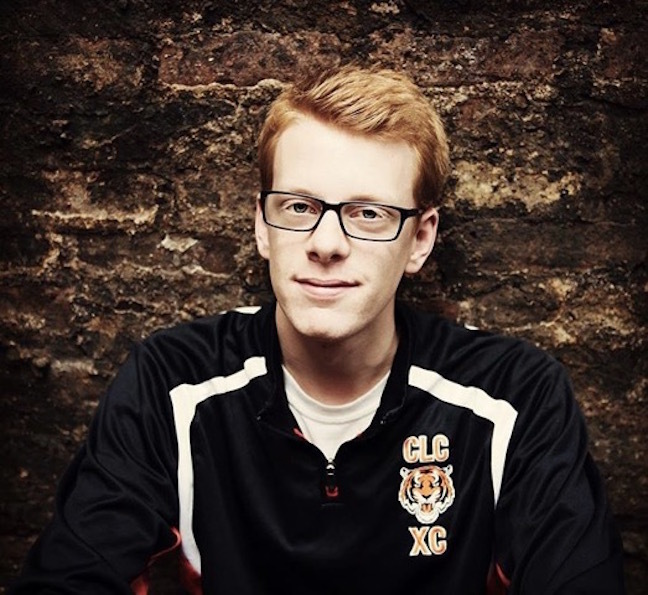 “My personal favorites are the stories from students, both undergrad and grad. As a mom of two young musicians, I can, to some degree, understand both the challenges and the thrills of their careers. Learning about their lives is the best part of my job. Occasionally I can help them, too. 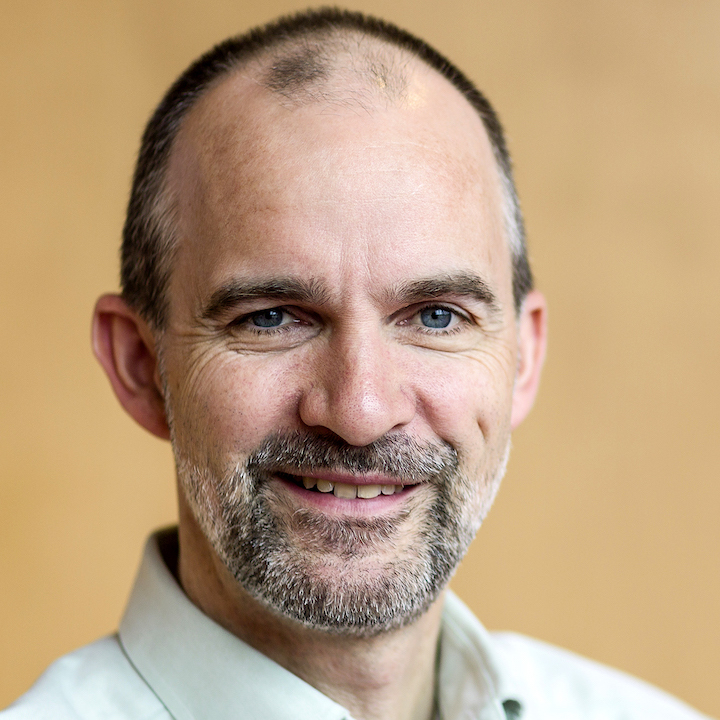 “A couple of other things to give credit where credit is due. “My assistant, Brianna Ware, who is a graduate student in piano, caught and corrected many errors. “The brochure was designed by Bob Marshall of Marshall Design in Middleton. He did a masterful job. Bravo! “Printing was coordinated by the fabulous Sue Lind at DoIT (Division of Information Technology) Printing and Publishing, who helped me to choose a new paper stock, a lightweight matte. “Lastly, upon request from our older readers, we increased the font size slightly. “We mailed the brochure to all alumni, national and international. That also was new. And our feedback has been quite positive. About twice a month, we also publish an e-newsletter in the form of a blog, which I also paste into an email for those on a Wisclist, who don’t get the blog. It is the same information, but I think the blog is prettier.